I have been using BIOSAgent since 2007 when I was working in a project that extensively dealt with system detection. It helped me to fix a lot BIOS issues by providing me every single piece of information stored in the BIOS. Sadly, this wonderful desktop, standalone BIOSAgent is no longer available for download now. The last version is 3.66. I don't have the last version but up to v3.61. BIOSAgentPlus is the successor or the replacement. The current version I tested is 2.2010.1.8. Unlike BIOSAgent, BIOSAgentPlus requires Internet connection for data interpretation. It doesn't scan your system over the Internet; currently you still have to download an EXE file to do the scanning and then interpret the scanned data at their online server. Default: Run BIOSAgentPlus while you are connected to the Internet. After the scanning, BIOSAgentPlus will auto-fetch the data. Offline: Set "Work Offline" (see my offline section below to see how) and manually submit your data to DriverAgent (another tool by eSupport). If the scanned data is auto-fetched by your local copy of BIOSAgentPlus, the result page will display not only the information of the BIOS but also every driver of your system. Any new driver(s) available to your system will also be shown in that page. If you post the data yourself, the BIOS information will not be displayed but you are still able to view the information of your existing and new available drivers online. Thus, the manual method at this point is useless. After all, the data is actually interpreted by DriverAgent, which won't interpret BIOS data. If you scan your system offline, BIOSAgentPlus will automatically open a text XML file for you. Do a search on <D:smbios> in the file and you should find all the BIOS data. On XP, this file is stored in the folder of %TEMP%\DriverAgent. Regardless of which method you use to submit and interpret the scanned data, you can always be allowed to choose to "Save Scan Data" for future use. This simply saves the reference data in a HTML file. Next time, you double-click on it and the data will be fetched and viewed from their online server. Again, Internet connection is absolutely required. With this, the BIOS data is always interpreted and displayed in the page. I personally don't like the BIOSAgentPlus because I am not interested in the driver information or its upgrade. I just want to instantly see what data was written in the BIOS. In addition, when I am doing this, most of time the Internet connection is not available or the system has not completely configured well yet. With BIOSAgentPlus, I have to do more steps to view the data or I interpret data myself. I really miss the nice and simple BIOSAgent. As usual, the downloaded EXE file doesn't require to install; simply download and run it. When BIOSAgentPlus runs and performs the scanning, on XP, the BIOSAgentAgent icon will be displayed in your system tray. Right click the icon, select "Work Offline" if the Internet connection is not available. If you need scan again, then click "Scan". Note that The Scan button will be grayed out while BIOSAgentPlus is scanning. As soon as the scanning is done, a text file named DriverAgent.xml.txt will be opened for you. Follow the instruction in that file and submit its XML content to http://driveragent.com/manual.php. As discussed before, the BIOS information will not be interpreted when you manually submit data to DriverAgent. 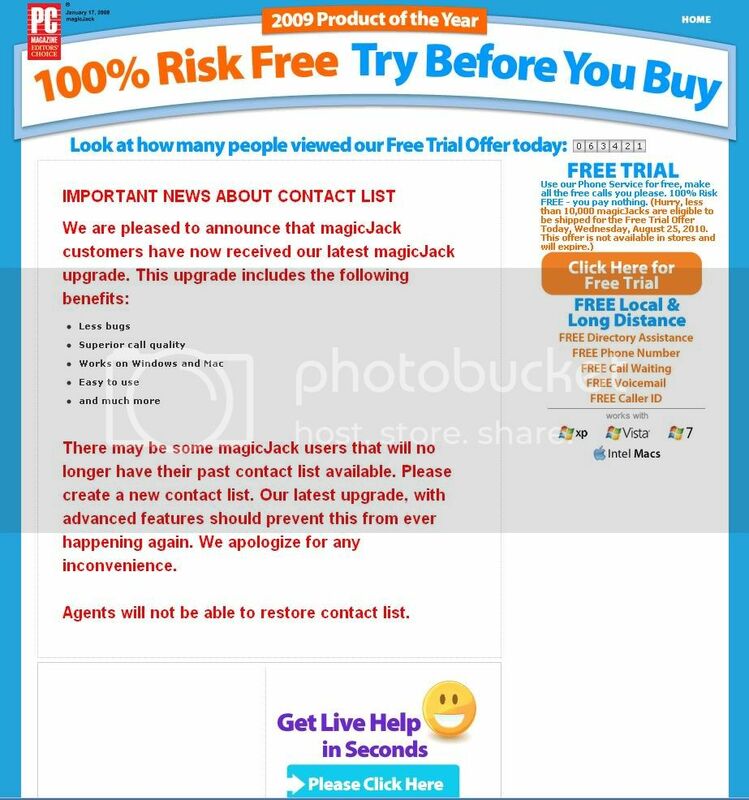 MagicJack has done some upgrade within these two weeks that cause some users' contact list wiped forever (see their current announcement or the captured image). In addition, the MagicJack drives are no longer accessible after the softphone has been up and running; both drives occupied by MagicJack become "CD Drive" and "Removable Disk" while the softphone is in service. I am lucky still to find my contacts list file in the device. Yours may still exist. See my how-to for details. From now on, all the profile information including the contacts list and the call history will be stored in the MagicJack server. Thus, your softphone may indicate "Contacts list is empty" after the upgrade regardless of the file existence in your device. Currently there is no way to upload the list to the server but manually input yourself. Unplug the MagicJack if currently connected. Wait a few seconds for your system to clear the device. Hold down the SHIFT key and then plug your MagicJack device in. DON'T RELEASE THE SHIFT KEY WHILE YOU'RE PLUGGING IT IN BEFORE YOU HEAR THE USUAL DEVICE CONNECTION SOUND. The SHIFT key will temporarily disable the softphone auto-run. Therefore, you should see two drives named "magicJack". Will Hong Kong be no longer to call Hong Kong? Next month I will go Hong Kong for visit. At the same time, I may go Shanghai for a few days if possible. I found that quite a lot of people now go by train instead of flight. Thus I started my research on train. There is a direct train traveling between Hong Kong and Shanghai. Each way operates every other day. I am surprised that a lot of people emphasized in their blogs to look for the word Jiulong for buying return train ticket in China. Huh? Jiulong? Where is it? Should it be Hong Kong? Some place in Hong Kong? Or the train station in Hong kong? The train station in Hong Kong to Shanghai is called Hung Hom Train Station and located in Kowloon, Hong Kong. There is no place or a train station in Hong Kong called Jiulong. Then where is Jiulong? After having done some digging, I finally reach my conclusion. Jiulong is the direct translation from Mandarin pronunciation to English. It is actually referring to Kowloon, the official name in Hong Kong. Why did China make this new name to Kowloon, Hong Kong? Has Kowloon already had a name in English? It is extremely confusing. This makes me wonder that Hong Kong may have a new name in English soon. 50 years unchanged? Certainly something have been changed on their ways. Look! The name is one of the changes. Would Hong Kong be called Xiang Gang in English in the future or whatever name in Mandarin? Note that Xiang Gang is the Mandarin pronunciation in English for "Hong Kong" according to one of the online dictionaries. Please correct me if it is incorrect. Will Hong Kong people accept this new name? Unfortunately, a lot of people don't even know. Today is my lucky and happy day. I finally got certified with ASP.NET 3.5. I was preparing it for the past few months. Today I finally get an award of it. My exam time was scheduled at 11:30AM today. I left and headed to the test center an hour ahead of my exam time. It was just about 10 minutes drive but I was almost late and missed the time because of the incorrect Google map. I kept calling the test center but I could not reach anyone. I was panic and even thought that I might be doomed today. The time was ticking and I had only 10 minutes left. Finally, my call got through and I arrived just right on time. Still, my feeling was not so good that I was afraid what happened before was to give me some sort of symbolic or indication that I could fail my exam. However, the result turns out fantastic (a perfect one) and it makes me keep smiling. The actual exam time lasts 180 minutes (3 hours) for 45 questions. But my confirmation sheet (from Prometric registration) said 4 hours because the additional hour was used for reading instructions, answering questions for survey (compulsorily) and leaving comments to questions after test (voluntarily). When I started taking the exam, the time was set to 180 and then counted down. I spent about 2 hours and read twice. The full score is 1000 and the passing mark is 700.